Crosscut lemon making an X. Leave one ½ inch of the lemon left in tact at the bottom to keep the lemon together. Fill each Lemon with 1 Tbs Diamond Crystal® Kosher Salt allowing the excess salt to fall into the bowl. 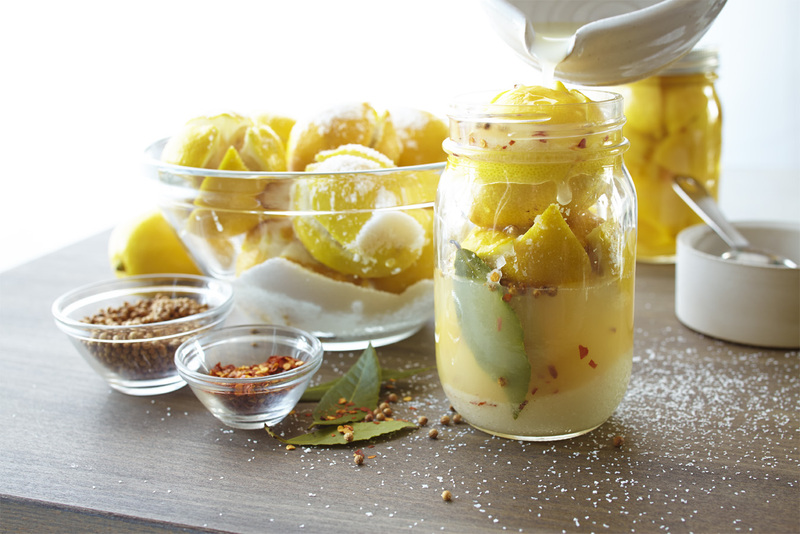 Place lemons into the jar as you are filling them with salt. Add whole coriander and red pepper to the jar, or other favorite spices. Once the jar is full, press down on the top lemon to release some of the juices into the jar. Add an additional tablespoon of Diamond Crystal® Kosher Salt to the jar. Fill the jar using the and lemon juice that was set aside. Seal the lid then gently shake to distribute the juice into the jar. Over the next 2 days, gently turn the jar over.